This easy, yeast-free beignets recipe is a snap to throw together the morning after your Mardi Gras celebration. For added atmosphere, do as they do at the famed Cafe Du Monde, and add a steaming mug of black chicory-coffee brew or a serving of cafe au lait for a complete breakfast. While you will see many recipes for beignets that use a yeast dough, but making them with choux pastry dough is also traditional. Choux is the familiar dough used in cream puffs and eclairs. It is made only with butter, water, flour, and eggs and the moisture in it allows it to rise without the need for yeast. This is what makes this the easy version of beignets since there is no waiting on the yeast and you can make them on the spur of the moment. You can use a deep fryer or a pan that is deep enough for oil to fry the beignets. A deep fryer should allow setting the temperature, but you will need to use a thermometer if using a pan. In a medium saucepan, melt the butter in the water. Remove the pan from the heat. Add salt and flour, and stir until a sticky batter is formed. The dough can be warm to the touch but should not be hot. Heat the oil to 375 F. If using a pan, check the temperature with a thermometer. Fry mounded teaspoons of dough, several at a time, for about 6 minutes. Don't crowd the fryer, ensure each beignet has plenty of room to move around. They may flip over by themselves, or you can use a slotted spoon to flip them so they cook evenly on all sides. They are done when they are light, golden brown on each side. Drain them for a few minutes on a clean kitchen towel or paper towels. When cooking them in several batches, ensure the oil comes back up to temperature before starting the next batch. Serve warm, dusted with the powdered sugar. For less of a mess, put the powdered sugar in a bag, add the beignets, and shake the bag gently to coat them. Enjoy! You can serve them for breakfast, dessert, or a great coffee or tea-time snack. 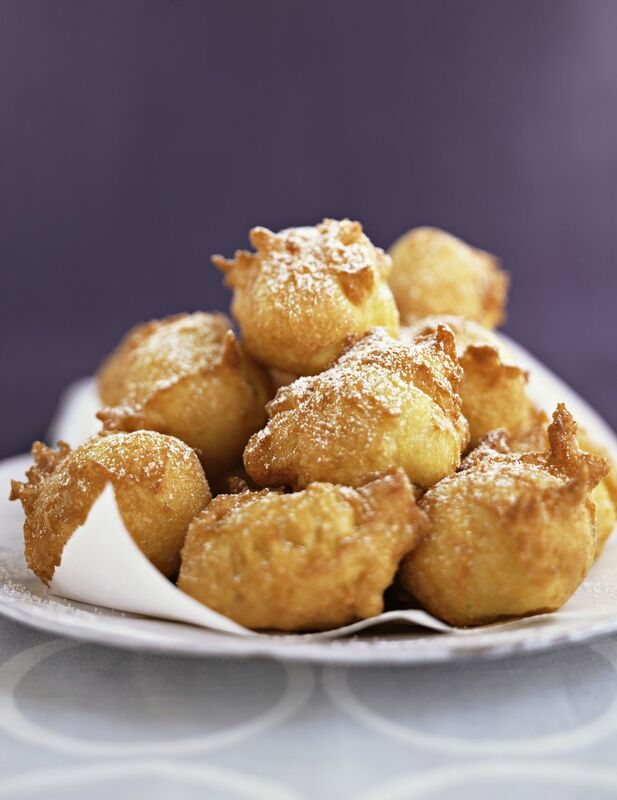 Beignet is a French term that means bump and it originally meant fritters made with choux pastry, as in this version. So while you may wonder whether you should really be taking the time to make a yeast dough, this is an authentic version. This pastry was enshrined as the official state doughnut of Louisiana in 1986, even though it has no hole. Beignets have been a traditional food for Mardi Gras (Fat Tuesday or the day before the start of Lent on Ash Wednesday) in both France and New Orleans.